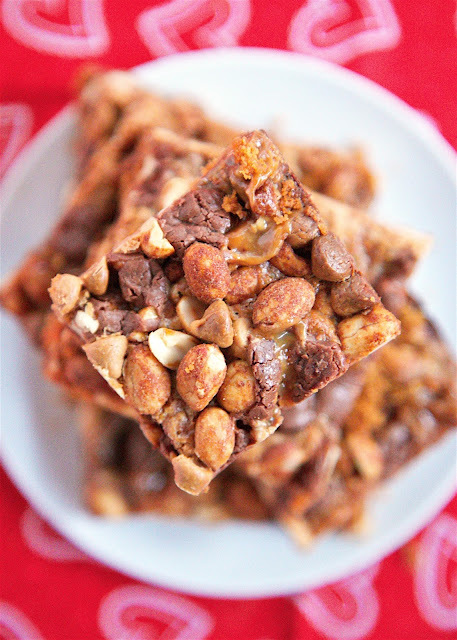 Peanut Butter Snickers Magic Bars - snickers baking bites, peanut butter chips, honey roasted peanuts on top of a graham cracker crust and drowned in sweetened condensed milk. SO easy to make and SOOO delicious! Everyone raved about them! Have you seen the new Snickers baking bites in the store? I found them at Wal-Mart during the holidays and stocked up. 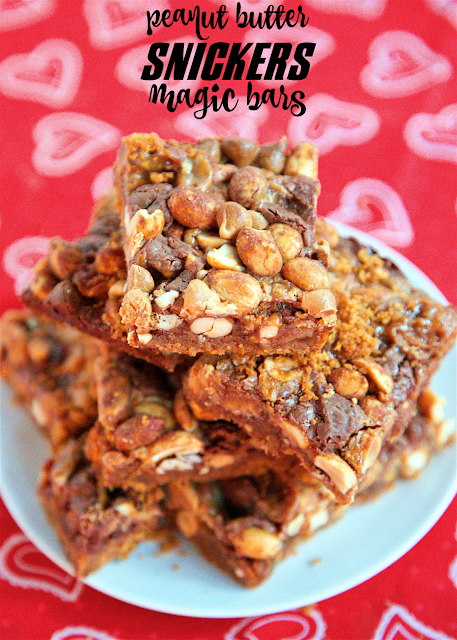 They taste great straight out of the bag, but they are even better in these Peanut Butter Snickers Magic Bars. Snickers, peanut butter chips, honey roasted peanuts on top of a graham cracker crust and drowned in sweetened condensed milk. O-M-G! These bars are so easy to make and they taste fantastic! You have to let them cool completely before cutting and serving. I tried to sneak a sample while they were warm and the bars were too crumbly. They tasted a million times better once they were cooled. I suggest cutting these into pretty small squares; they are pretty rich. They would be the perfect treat for your Valentine! Combine graham cracker crumbs and melted butter. Press into prepared pan. Pour sweetened condensed milk evenly over top of graham cracker crumbs. 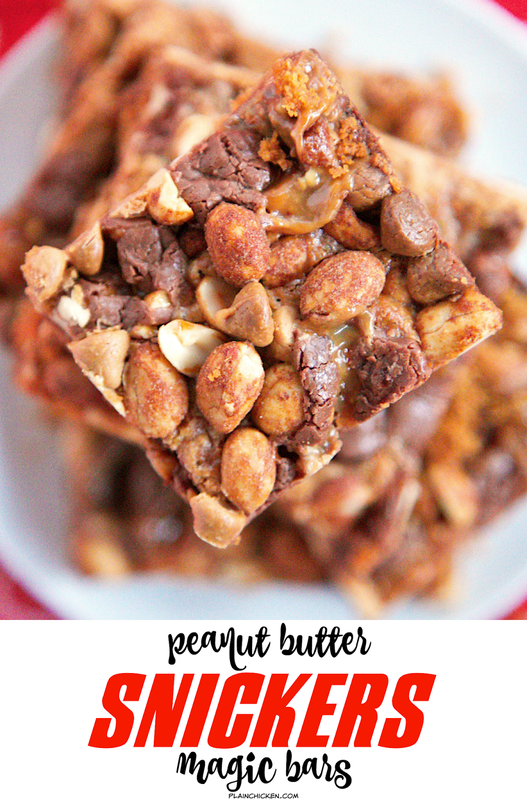 Top with snickers, peanuts and peanut butter chips. Bake for 25 to 30 minutes. Remove from oven and cool completely before cutting into bars. Just out of curiosity, which variety of condensed milk did you use? These look delicious and can't wait to try them! I used chocolate - Enjoy!